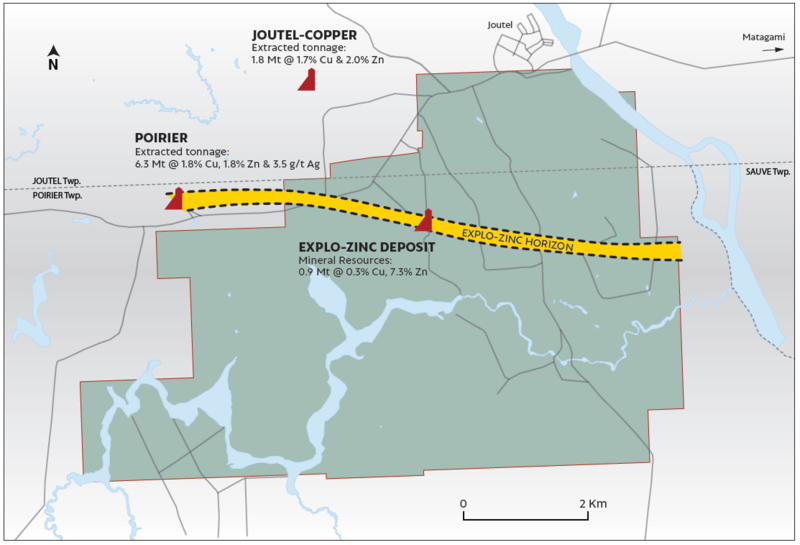 The Joutel Explo-Zinc project incorporates former Cancor’s Kistabiche, Bonfortel and Poirier projects. It is located 135 km north of Amos (Abitibi, Quebec) in Joutel and Poirier Townships, and is accessible by road in all seasons. Yorbeau owns a 100% interest in the Bonfortel and Poirier blocks, while the Kistabiche block is owned and operated as a joint venture between Yorbeau and SOQUEM with respective interests of 73.87% and 26.13%. Between 1963 and 1966, Consolidated Northern Exploration Ltd (“CNE”) discovered a zinc deposit, currently known as Explo-Zinc, sank a 389-metre shaft and excavated 1,630 metres of drifts on 3 levels. CNE also drilled 195 underground holes totalling 23,369 metres to explore several zinc-rich lenses of volcanogenic massive sulphides. The latest work on the property was done by Cancor with three holes totalling 596 metres drilled in 2006 to get metallurgical samples and confirm mineralization in preparation for a resource estimate, and two holes totalling 1,907 metres drilled in 2008. The Joutel Explo-Zinc property covers a large portion of felsic volcanic rocks of the Joutel Volcanic Complex. These felsic rocks belong mainly to the Joutel Formation which hosts two former base metal producers, the Poirier Mine and the Joutel Copper mine. Structurally, the felsic volcanics appear to be grouped around and within a caldera measuring 4 to 5 kilometers in diameter, with the massive sulphide deposits located on the rim of this caldera. The majority of holes drilled by Cancor intersected narrow chlorite-rich horizons which are mineralized with sulphides such as pyrite, sphalerite and chalcopyrite. These chlorite-rich zones are interpreted as channelways for the hydrothermal mineralizing fluids that generally accompany the emplacement of massive sulphide bodies. The most promising horizons were cut in hole KIST-06-16 which intersected 2.3 metres running 0.62% Zn and 9.21 g/t Ag in chloritized rhyolitic rocks, and in hole KIST-06-15 that cut strongly chloritized felsic rocks with minor sphalerite in an area considered to be the extension of the Explo-Zinc deposit west of a major fault. A Mineral Resources estimate for the Explo-Zinc deposit was prepared by Paul Girard, P.eng., PhD in 2006, and reported in accordance with Ni 43-101 regulations. The above resources are included in five lenses located near the shaft and existing drifts. Geological interpretation work was initiated and some key drill core was reviewed by Yorbeau’s staff. It was concluded from this preliminary work that there are some very large zones of strong hydrothermal alteration on the property and that there is therefore potential for a large deposit in the area. Significantly, a strong borehole geophysical anomaly (conductor) was detected along strike and to the northwest of the Explo-Zinc deposit. This constitutes a first priority drill target and will be drilled in 2018.